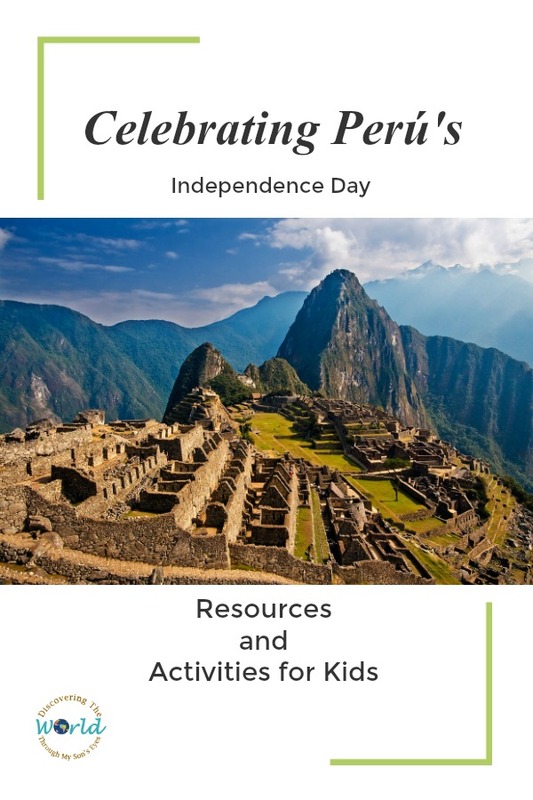 July 28 marks Peru’s Independence Day also known as Las Fiestas Patrias. To celebrate this day, I am honored to share with you a lovely essay from my friend, and author Mariana Llanos. It’s a short essay on her love for Peru. 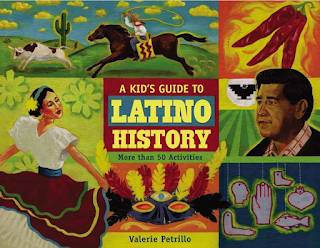 You will also find some quick historical facts, and activities to do with your kids for Peru’s Independence Day. During this month little one, and I have been discovering Peru. We learned about the ocarina musical instrument, played with hand-made finger puppets, and even cooked a tasty pollo a la brasa, and lomo saltado. 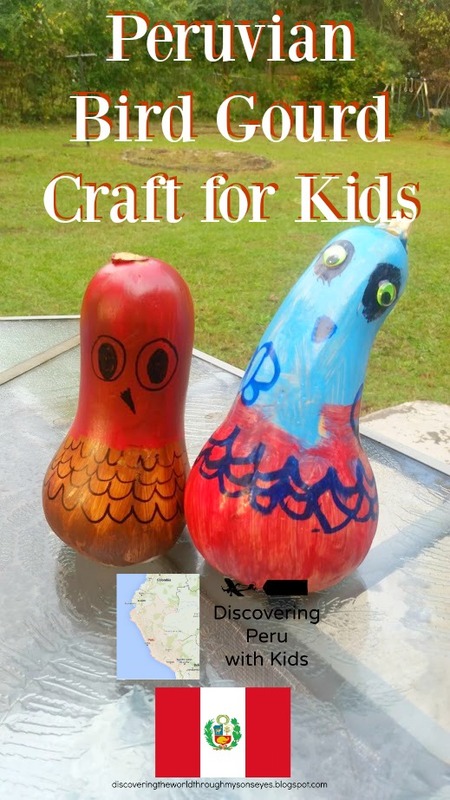 Today, we’re sharing with you an easy Peruvian Bird Gourd Craft for kids! 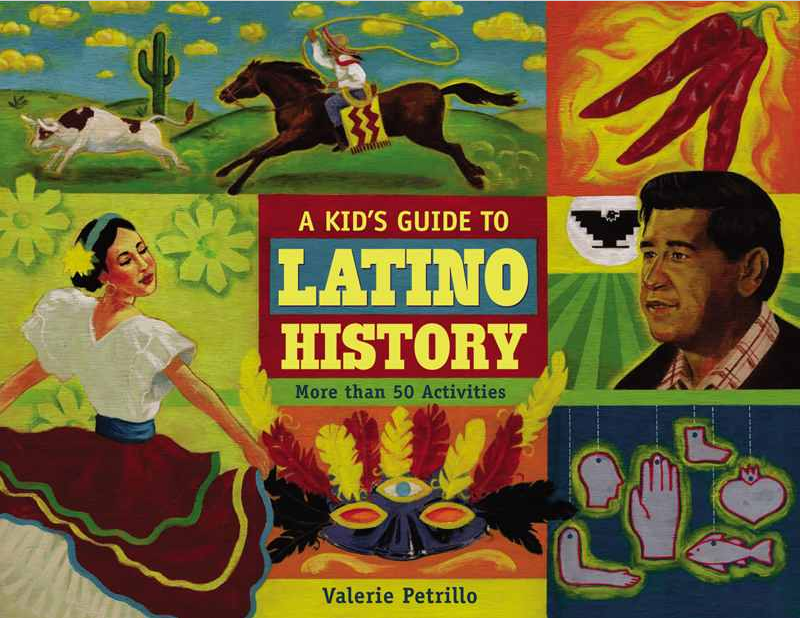 My go-to reference book is A Kid’s Guide to Latino History: More than 50 Activities (A Kid’s Guide series) (affiliate link). In this book you can find many activities to do with your children. One of the activities to learn about Peru was a gourd. A Peruvian gourd is usually carved and it’s an art tradition practiced for many generations. 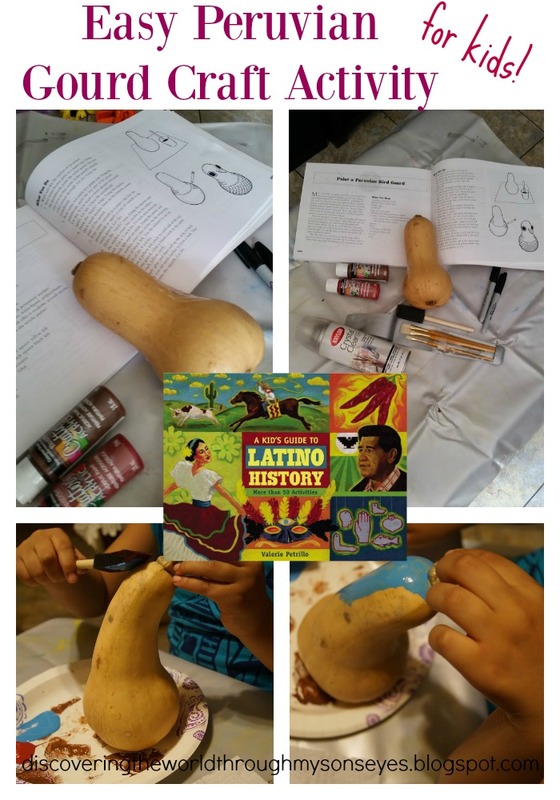 Andean people used gourds to store their food, and today they have many uses. Artisans use these for storage and decorative pieces. Gourd carving in Peru has been practiced for more than 4,000 years. They would be used for story telling, and it also served as a record of celebrations, oral traditions, rituals, myths, and weddings. Little one didn’t carve the gourd. We actually used paint to color it. The suggested colors were a deep red, and brown; but my 7 year old insisted he wanted blue! Anyways, I think it was an awesome activity to learn about a centuries old tradition in Peru. 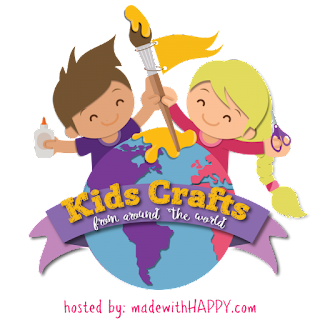 This post has been shared as part of the Global Learning for Kids series on Multicultural Kids Blog, and Made with Happy’s Kids Crafts from Around the World. All month long you’ll be able to see some awesome posts on crafts from around the world from a group of crafy mamas! Click on the image below to see the other countries from around the world. I love participating in Multicultural Kid Blogs Global Learning for Kids Series. It gives us as an opportunity as a familia to research, and learn about another country. This month’s country is Peru. We’re thrilled to learn about Peru. A beautiful country in South America, surrounded by Ecuador, Colombia, Brazil, Bolivia, and Chile. Official name is Republic of Peru with a Constitutional republic government. The capital is Lima, and it has a population of 30,147,935. The official languages are Spanish, and Quechua. Currency is Nuevo Sol, and the country is well known for it’s Andes mountain range. The people of Peru are a mix of many different cultures, including Indians, Spaniards and other Europeans, descendants of African slaves, and Asians. As an introduction to the music we listened to Daria’s Cancioncitas De Los Andes / Little Songs of the Andes. Music in as excellent way to expose children to another culture. Luckily for me, during last year’s visit to the International Festival I purchased a Peruvian ocarina, and a gourd ornament. Little one enjoyed playing the Peruvian ocarina an ancient musical instrument. Multicultural toys are hard to come by but are a wonderful resource to introduce your child to a country’s culture. I totally scored big time when I was able to purchase these adorable animal finger puppets from Daria’s Little Village Store. These are finger puppets hand crocheted by women artisans in Peru. Little one played with them for hours on end, and it gave us an opportunity to learn about the animals in Peru. Now the most exciting part on learning about Peru was making Pollo a la Brasa! It’s a Peruvian-style roast chicken. So yummy, and delish! I used the recipe found here, but instead of roasting a whole chicken marinated pieces of chicken breast, thighs, and legs. We let the chicken sit in the marinade for 24 hours, and popped it in the oven the following day. I must say the aroma was heavenly, and delicious! 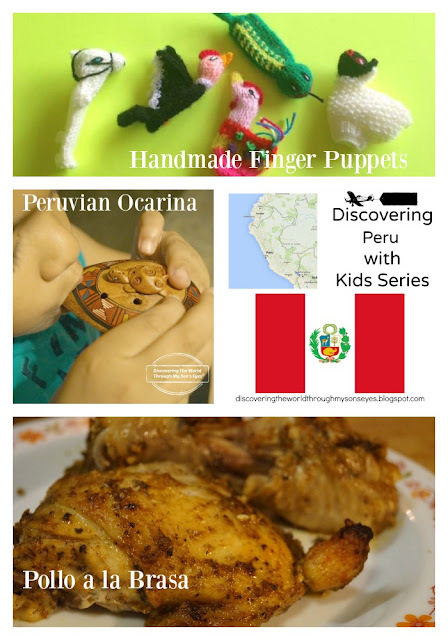 Be on the look-out for our next post on Peru with a wonderful craft that the kids are sure to love!